One of the simple wonders of living on a spinning ball with a thin atmosphere in a densely packed corner of space is the view. Many of us dream of settling down by a picturesque coastline or a rugged mountainscape, but we so often forget that the best scenery on planet Earth is located directly overhead. Part of the problem is that we’ve drowned that scenery out with light pollution. While there are approximately 4,500 stars visible from a remote location on a clear night, that number drops to just a few hundred in the suburbs, and less than fifty from the downtowns of major cities. Astrophotographers Harun Mehmedinovic and Gavin Heffernan are on a mission to show the modern world what it has sacrificed in the name of electrification. Through Project SKYGLOW, the two are traveling to remote locales around the country, capturing jaw-dropping footage of the night sky and honestly, making the rest of our day jobs seem rather lame. Mehmedinovic’s latest shoot brought him to Fort Union, New Mexico, a Civil War preservation site located in a short grass prairie valley along the Santa Fe Trail. Fort Union was once the site of bitter clashes between Confederate and Union troops, including the Battle of Glorieta Pass, which ultimately ended the Confederate army’s bid to take over New Mexico, forcing its troops back into Arizona. 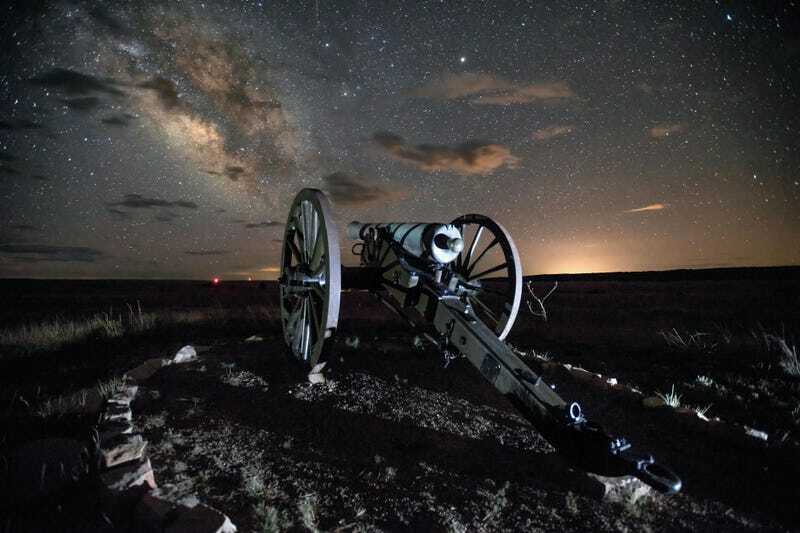 People travel from all over the country to see the remains of Fort Union’s historic adobe forts, but what many aren’t aware of is that this site also harbors some of the most pristine dark skies in the country. Mehmedinovic has kindly shared some still images of the shoot with Gizmodo, along with “Fort Lullaby” a time-lapse video that fittingly opens to “Taps” at dusk before transitioning into some dark and dramatic desert melodies as the cosmic light show begins. If you’re as awestruck by Mehmedinovic’s work as I am, be sure to check out more of Project SKYGLOW on Facebook, Instagram, and at skyglowproject.com. I don’t know about you, but when times are dark, I like to remember that the darkness is full of stars.